Having received the DVD for Christmas, I took a moment to watch it. A good slice of fun for informed and uninformed music lovers. 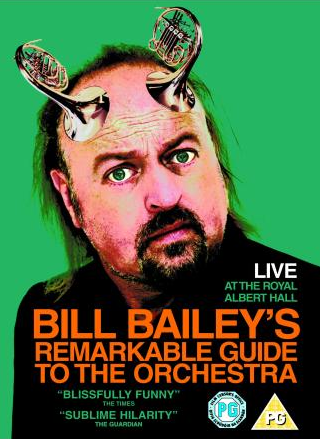 With demonstrations like “Bassoons have been secretly in love with the Bee Gees and incorporating them in classical music”, or “Hats off to the zebras!” and naturally “Docteur… Qui ?”, Bill Bailey largely uses the BBC orchestra’s capacities to give to everyone classical sounds… slightly adapted to the modern audience! Londonian of heart, he has to give a place to cockney music, and tries to have the last musical word against Anne Dudley. It is pure genius! Obviously, Anne Dudley is very courageous to bear with this man who describes himself as “part troll”… anyhow, it is more than one hour of extraordinary musical humour in the line of Hoffnung or de Marianne James.